Leda Garside, RN, is at the forefront of an innovative program that addresses the health care needs of agricultural workers in Oregon’s burgeoning wine industry. Oregon continues to gain wide recognition for its world-class wines and wine grapes. An economic impact study released by The Oregon Wine Center 2006 states that the wine industry generated $1.4 billion in economic activity for the state in 2004. Also during that year, the industry and related businesses provided at least 8,479 wine-related jobs and $203 million in wages. The Willamette Valley’s temperate climate – almost identical to the major wine-growing regions in France – promises a bright future for Oregon’s wine industry. Beyond the Pacific Northwest’s geographic gifts, another important component of the success of the state’s wine and wine grape industry is the people working the fields. 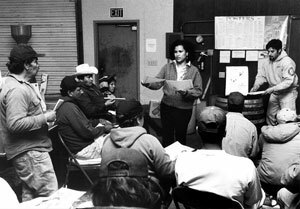 Latinos make up majority of agricultural workers who provide much of the labor for Willamette Valley vineyards. Like many other industries, ensuring health care access for a large workforce has been a challenge for the wine industry. Marking her 10th year as manager of Tuality Healthcare’s ¡Salud! Services – a program that educates workers on preventive care and provides support and advocacy for accessing health care – Garside is focused on continuing to improve health care access for agricultural workers. 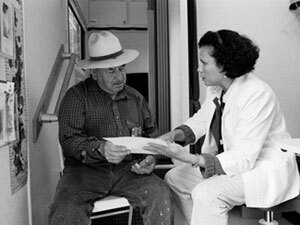 In 1992, wine growers and the health care industry decided to join forces to solve the problem of health care access for agricultural workers in the region. The alliance heralded the beginning of ¡Salud! But first, the alliance had to secure funds to make the ¡Salud! concept a reality. The team drew inspiration from one of the oldest wine auctions in the world – held each year to raise money for a charity hospital in Beaune, France. For more than 145 years, wineries from the region – which produce some of the best Burgundy varietals in the world – auction off new wines in barrel to raise money for the hospital. To this day, the hospital is fully supported by revenues from the world-famous wine auction. With its first successful wine auction in 1993, ¡Salud! was off to a great start. “¡Salud! had to evolve and grow to adapt to the needs of the population. Our goals became: how can we make the program better? How can we reach more people?” she said. Garside joined Tuality Healthcare as an occupational therapy nurse in 1992. A native of Costa Rica, she immigrated to the States in 1976. She attended the University of Alaska to earn her nursing degree. Working as a nurse while raising a family, Garside expertly balanced the demands of family life and a career. Her husband’s job took the family to live in different states until the Garsides decided to settle in Oregon in 1991. With her years of experience as an RN, Garside has been involved in the ¡Salud! program since its inception, albeit indirectly. 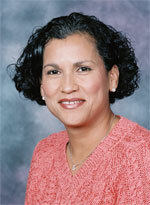 She was one of only a few Spanish-speaking staff at Tuality Healthcare when ¡Salud! Services was established. Initially, Garside helped teach CPR training classes and provided other educational opportunities for vineyard workers. In 1997, she took on a more central role in taking the program to the next level. She was energized by the opportunity to serve a ground-level – almost entrepreneurial – management position to grow the program. "It was a good opportunity to give something back. 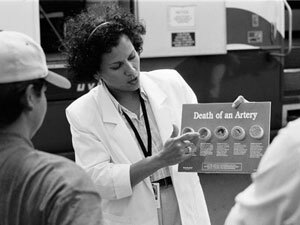 Community health was something that has always interested me. It was a challenge – a turning of a new leaf for my life. I liked the prevention and education aspect of the job, and the opportunity to use my Spanish skills to serve the community,” she said. While ¡Salud! Services were focused on Washington County, Garside soon identified other wineries and vineyards in other counties – Yamhill, Polk, and Marion – where workers also needed health education and access to care. Garside’s next step was to identify community health centers to forge partnerships with ¡Salud! Services. Merging community partnerships with ongoing health education for workers, Garside established a solid foundation for ¡Salud! Through mobile clinics and regular visits to the vineyards, Garside and her staff interface directly with workers and their families. For Garside, developing trusting and respectful relationships with her clients is of foremost importance. The program continues to be fully supported by the proceeds of the annual ¡Salud! Oregon’s Pinot Noir Auction.. In 2006, 42 participating wineries donated cases of the very best Pinor Noirs from their cellars – wines made especially for the auction. More than $750,000 were raised. In addition to the region’s finest Pinor Noirs, other items such as trips to wine-producing regions of the world were also auctioned off. Growth of the ¡Salud! wine auction – held every second weekend of November – is remarkable. “When we first started, we only had about 18 wineries participating. It’s amazing to see the commitment of our industry partners,” she said. For Garside, developing the ¡Salud! program is among the highlights of her career. Her efforts have been lauded by the Portland Chapter of the National Association of Hispanic Nurses, which recognized Garside as the recipient of its first-ever Chapter Leadership Award in 2005. Also in 2005, Garside was appointed by Gov. Ted Kulongoski to the Oregon Health Services Commission, charged with reviewing and updating the Prioritized List of Health Services for the Oregon Health Plan (OHP). In her role with the Health Services Commission, Garside is involved in determining the listing of health services and how they should be ranked for OHP funding. The commission considers both clinical effectiveness and cost issues. Decisions are based on peer-reviewed medical literature, public input on values and perceptions of health care priorities, and other key information sources.